I don't care what you say, once Christmas is over, it's Spring time in my eyes and what better way to get us through the long month of January than knowing come February 1st, Clinique are launching their Almost Spring 2012 collection featuring some pretty, delicate and feminine colours to make it look like we're not wearing make up, when we big fat are! 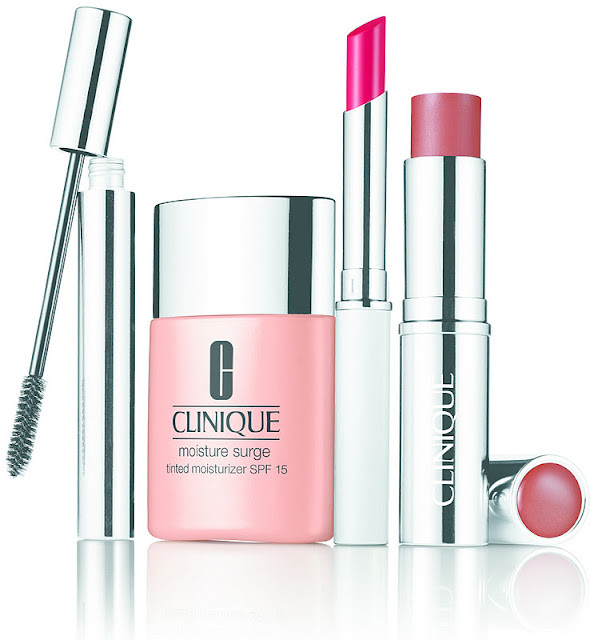 New to Clinique is their Almost Lipstick (€18.50). Described as neither a lipgloss or a lipstick, this, well, lipstick for want of a better word, gives a hint of colour while still allowing your natural lip colour to come through. Accompanying the shade Black Honey is seven new shades that are named to make me feel like I'm picking my favourite Spice Girl from back in the day! Which honey are you? For the lucky clear skinned ladies out there, the Moisture Surge Tinted Moisturiser (€28.00) is here to even out your complexion while helping strengthen the skin's moisture barrier. It's available in six shades and contains SPF 15. Tinted moisturisers are hard to wear if you're an oily faced person like my good self. Finally is the Naturally Glossy Mascara (€19.00) available in Jet Black. Containing high-tech binding ingredients, there's no smudging, flaking or clumping, just natural looking lashes. I did a make up look inspired by Downton Abbey and these products would have made my life so much easier! They're exactly what you would need for a fresh-faced, radiant look and if Spring were make up products, they would be these. What do you think ladies? Is anything speaking to you? Is anything saying to you "come buy me when you finally get paid, it has been the longest month ever and you need to treat yourself, sure it's Almost Spring"?! Oh I love Spring make up - right up my alley, light fresh and perky! And I think this is one season Clinique can totally nail. Almost lipstick looks fab and I bet the mascara is good ... sort of excited! I'm the same as you once Christmas is done I look forward to all the bright spring colours! those lipsticks look so light and pretty can't wait to start my spring haul.. as if I need another excuse! I don't even know what Lovely Honey looks like but what I know is that I want it. How shallow of me! carmen xo - glad i'm not alone in my love of spring! I've never tried clinique make up, this looks really nice though!I might give it a little try on the stands!